Create a 15-sec video based on you chosen bios-inspired theme: sporty, stylish, cool, fun or unique. Click on submit now! to fill in your details, then upload your video. Once you video appears on gallery of stars, get as many 'likes' by using the application to share on you wall. Top 18 videos will be selected based on number of 'likes'. Top 9 finalists will be chosen by Mentors to produce their own videos. 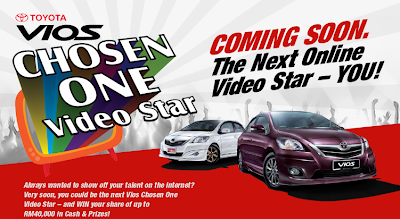 Visit Toyota Vios Facebook fan page for more details.